Situated just 300 metres from Gare de Lyon TGV Train, RER and Metro Stations in central Paris, this air-conditioned hotel offers a 24-hour reception and ticket service. 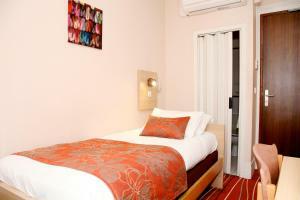 The soundproofed rooms are equipped with free WiFi access. 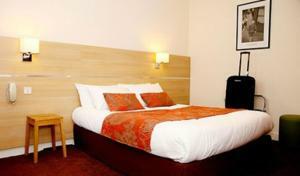 Hôtel de France Gare de Lyon Bastille is located just 500 metres from the banks of the River Seine. The trendy nightlife of Bastille is a 10-minute walk away. Public parking is available nearby. These air-conditioned triple rooms feature soundproofing and offer views either of the property's interior courtyard or of the street. The private bathroom is equipped with a shower, toilet and hairdryer. A welcome tray will be provided in the room upon arrival and extra features in the rooms include a minibar, a flat-screen TV with Canal+ and free WiFi. These air-conditioned quadruple rooms feature soundproofing and offer views of the street. The private bathroom is equipped with a shower, a toilet and a hairdryer. A welcome tray will be provided in the room upon arrival and extra features in the room include a minibar, a flat-screen TV with Canal+ and free WiFi. Rate: € 132.07 ... € 889.00; select dates below to get current rates. Rate: € 126.96 ... € 961.50; select dates below to get current rates. Rate: € 181.00 ... € 1082.00; select dates below to get current rates. This family room has a minibar, sofa and air conditioning.